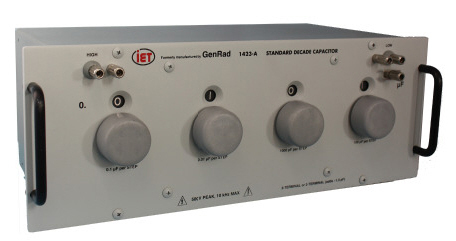 The GenRad 1423 decade capacitor is a versatile tool for calibration laboratories and production-line testing. With it a bridge can be standardized to an accuracy exceeded only by that of the highest quality, individually certified laboratory standards such as the GR 1404 Reference Standard Capacitors. values with minimum setup time. Any value of capacitance from 100 pF to 1.111 ;.F, in steps of 100 pF, can be set on the four decades and will be known to an accuracy of 0.05%. The terminal capacitance values are set precisely to the nominal value and can be readjusted later at calibration intervals, if necessary, without disturbance of the main capacitors. The 1423 decade capacitor consists of four decades of high-quality silvered-mica capacitors similar to those used in the GR1409 Standard Capacitors. The capacitors and associated switches are mounted in an insulated metal compartment, which in turn is mounted in a complete metal cabinet. This double-shielded construction ensures that capacitance at the terminals is the same for either the three-terminal or the two-terminal method of connection (except for a constant difference of about one picofarad). This external capacitance can be included in the two terminal calibration by the adjustment of a single trimmer.